Just Cause 2 has inspired some amazing feats including the deaths of 1.5 billion soldiers and 26 million hours of play time. 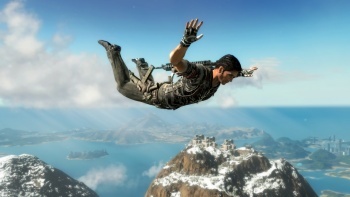 The open world game Just Cause 2 offers the fictional island nation of Panau as a sandbox for players to jump out of planes, hijack military vehicles and generally wreak havoc by blowing installations and killing criminals. Avalanche Studios, the makers of Just Cause 2 released some really amazing stats collected over the six months since the game has been out. Some gamers have relished the freedom that Just Cause 2 gives them, including one gamer who has played for over 1,100 hours. That's over 45 days, people, in just six months. And Just Cause 2 isn't even an MMO. I have to admit that even though I wasn't a fan of the game's storyline and cinematics when it came out in March, and I thought the parachute travel mechanics were frustrating, these stats kind of want me to pick up Just Cause 2 to try some of this stuff out. Like, seriously, hijacking the hot air balloon and base jumping 6500 meters? That's just fun. In the six months since release, players of Just Cause 2 have racked up a total game time of 26,118,470 hours. This is equal to around 1.1 million days of play time...Just a little under 3,000 years! Over 15,500 player have clock in over 50 hours playing the game with one player spending 1,100 hours, or 45 days, on Panau Island. 570,329,383 meters - The combined height of each player's highest base jump is roughly 14 times the circumference of the Earth, or the equivalent of freefalling from the moon one and a half times. 6,800m - The highest possible base jump in the game is not from land, but from one of the many Easter Eggs...the hot air balloon. It can be flown up to the limit of the game world for a truly record-breaking freefall. Only 160 players have accomplished this feat. 1,500m - The highest point on land is not the location for the game's longest land-based freefall. A mountain near Kampung Enor Bengkok in Panau's desert has a steeper incline. 380m - The average highest base jump across all players is roughly equal to a leap off the top of the Empire State Building. Players have driven an incredible distance across the Panauan landscape with one player clocking in over 65,000km. 288,006,325m - Players have climbed a distance equivalent to over 32,500 times the height of Mount Everest. Taking down the game's 50 colonels has proved no mean feat, with only 16,741 players accomplishing the task. 9.9 million - Total propaganda vans destroyed. 1% of players have taken out all 100. 13 million - The number of statues of the beloved leader destroyed. However less than 1% of players have managed to destroy all 90.